Misogyny, thy name is stupid! Twice in the past month, two socialist guys ridiculed my running for office. One called it a political stunt & the other questioned my capabilities. Are they kidding me!? Have they checked out the alternatives? Do they think Trump, Cruz, Clinton, or Sanders are suited for anything other than animal control officers? And only then after they get extensive remedial job training? Misogyny, thy name is stupid. No one knew better than me how hard it would be to run as a socialist while the socialist movement is so divided. But only the timid & defeated admit impediments to necessity? Somebody has to stand up against the corporate fiasco of US electoral politics & say the right thing. Why not me, since I’m one of America’s oldest activists? Is anybody sane in charge on this planet? It’s good news that some governments are taking proactive measures to prevent the spread of Aedes mosquitoes carrying the Zika virus. In adults, the virus can cause a mild rash & slight fever but infected pregnant women can have babies with microcephaly, a condition with an extremely small head & brain damage. The parents of microcephalic babies profess the same love for their kids as any other but in countries without social services for those with disability, it’s an extreme burden & stress that the already poor do not need. 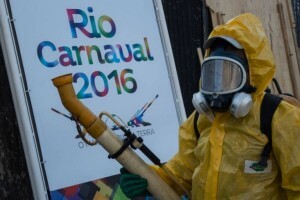 The chief proactive measure against Zika requires fumigating with toxic chemicals which have a range of health risks, especially affects on the nervous system, which includes the brain. Brazil had 163 cases of microcephaly per year between 2010 & 2014 but has already reported 3,530, including 46 deaths, since the beginning of 2016. Brazil’s health minister claims they mobilized 220,000 members of the military to go door-to-door in the eradication campaign. The municipal fumigator (in the top photo) suited up in protective clothing is in Rio de Janeiro. The women (in the bottom photo) is in Guerrero, Mexico (a country which also has a high rate of Zika) & is only covering her mouth as her home is fumigated against Aedes mosquitoes. Are there children in the home? Elderly? Infirm? Did the fumigators come all suited up & expose her & her family to chemicals that could also cause brain & nervous system damage? Are we living in the twilight zone? Is anybody sane in charge on this planet? It may surprise many that Israel, which bills itself as the only democracy in the Middle East, does not have a constitution or a bill of rights. When paramilitary terrorist groups set up Israel, they chartered a constituent assembly to formulate one but it couldn’t broker the immense contradictions between conservative Jews who considered the Torah sufficient legal foundation for the colonial state & more secular Jews who wanted a modern constitution to legitimize colonialism. Democracy & theocracy are mutually exclusive, but more importantly, democracy is incompatible with colonialism & apartheid, the actual legal reality of Israel. The constituent assembly, unable to fulfill its mandate, morphed into the Knesset, Israel’s parliament or colonial administration, which extemporizes a legal framework according to the needs of apartheid. Last Sunday, the Knesset passed a law allowing police to stop & frisk without probable cause. Probable cause is a fixture in any bill of rights (though habitually flouted in the US Black community). The Jerusalem Post, an unsavory Israeli publication, said the Knesset was “expanding the meaning of probable cause” by eliminating it. When did sarcasm become accepted legal analysis? The question is why does Israel need such a law when that has been its colonial practice for 68 years? The rationale given is to counter the threat of knife-wielding Palestinians but that’s baloney. Under the occupation of the West Bank, East Jerusalem, & Gaza, it’s routine for Israeli soldiers to body search without probable cause & there’s plenty of photographic documentation for that. At gunpoint, soldiers stop & frisk adult men, adult women (including by male soldiers), old people, & kids on their way to school. Part of the procedure often involves aggressions like kicking the legs or pushing in the back of the knees to make people fall. This colonial practice goes along with all the other policies like extrajudicial killing of Palestinians; curfews & restrictions on the movement of Palestinians; banning Palestinian workers from Israeli worksites; demolition of homes; torching of homes & mosques; arrest & incarceration of small children; indefinite incarceration without criminal charges. Israel never lets a little stinking law stand in the way of its colonial mission. Far from being a democratic institution, the Knesset is a colonial administration that will improvise any legal fiction required to facilitate the expropriation of Palestine, including harassment, humiliation, & the constant use of extreme violence. 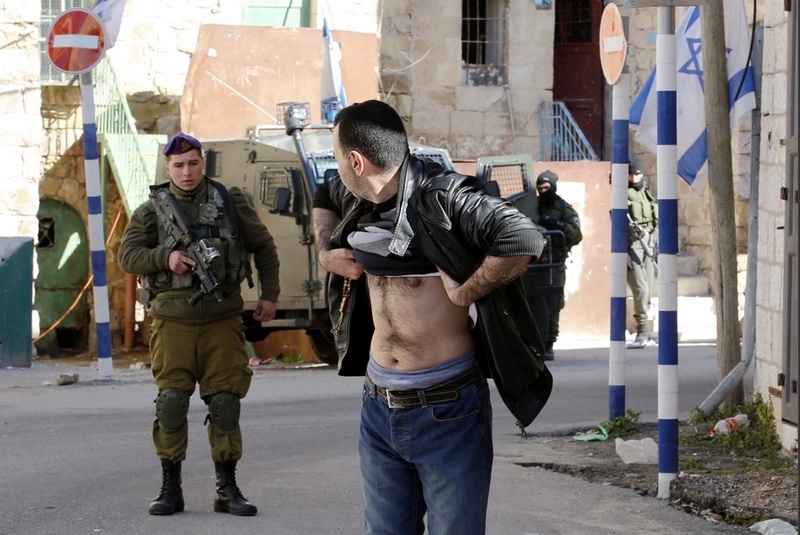 In this photo, an Israeli soldier is ordering a Palestinian man to lift his clothing for a body search in Hebron, West Bank. We aren’t told, but the young fellow was likely on his way to work or school & there was no reason in the world to suspect him of plotting a crime. 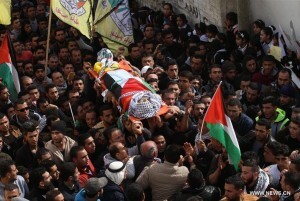 This is just pro forma practice under Israeli occupation. Build & honor the economic, cultural, & academic boycott of Israel. Buy nothing with a label beginning 729. I love the political tradition of burning effigies. We don’t have that tradition here but we sure as hell could use it since we have more than our share of psycho politicians. Come to think of it, a lot of the effigies burned overseas are US politicians. But why haven’t they gotten to Kissinger yet? He should burn before he ever gets to hell. Filipino activists seem to have mastered effigy making & effigy burning & should consider offering workshops on how to do it with style. 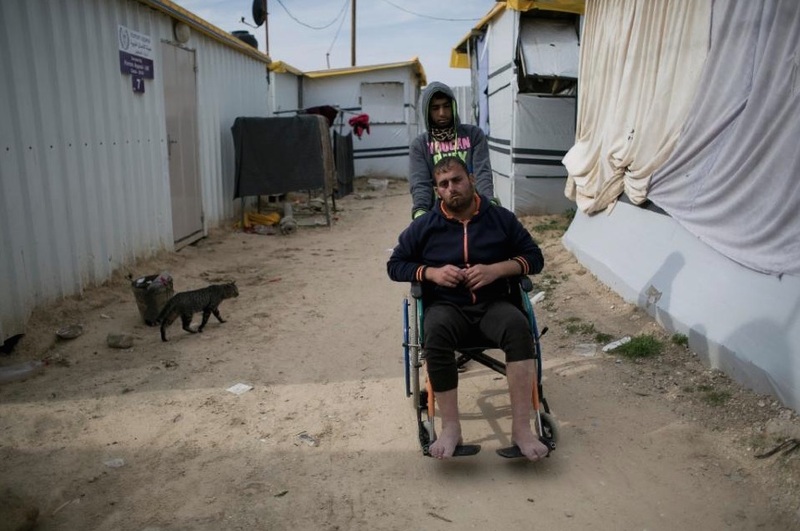 Samir al-Najjar became wheelchair-bound after being shot by Israeli soldiers in 2008. He & his family live in temporary housing in Khan Yunis, Gaza, since their home was destroyed by Israeli bombers in the 2014 carpet bombing siege. “We live–but that’s only because we’re not dead,” al-Najjar said. It really is justice time for Palestinians. Build & honor the economic, cultural, & academic boycott of Israel. Check every label & buy nothing with a barcode beginning 729. Solidarity is imperative. The French Foreign Minister Laurent Fabius just announced that France will initiate an international conference to “bring about the two-state solution” for Israel & the Palestinians & will recognize a Palestinian state. Mahmoud Abbas says he’s all for the conference. What bad idea isn’t he in favor of? Monsieur Fabius should have been picked up soon after the announcement & sent back to the planet he flew in from. There is no future in a bantustate solution for Palestinians. And no justice either. There is no future in continuing these phony peace negotiations where more concessions are wrung from disloyal & unelected Palestinian representatives. Why should Palestinians have to concede an iota to Israeli colonialism? They’ve sustained more than enough already. When Palestinian activists propose a democratic secular state where Jews & Palestinians live as peers, that involves massive compromises & an extraordinary political & humanitarian spirit that puts the past of Israeli colonialism & apartheid behind to forge a new future based on fraternity & sorority. It’s a just solution & the only workable one. A bantustate solution for Palestinians is a pipe dream only promoted by those committed to the existence of a Jewish-only state. It’s politically dishonest & reprehensible to blither on about a two-state solution whilst Israel continues to move in Jewish settlers from all over Kingdom Come to take over & live on Palestinian lands. Israel has no intentions of a bantustate solution. That’s what ethnic cleansing is all about–to make Palestinians go away. To believe otherwise is more idiotic than to be on Medicare & still believing in the tooth fairy. The French initiative came after UN official Ban Ki-moon told the Security Council that Israel’s expansion of Jewish settlements in the West Bank ‘raised questions about its commitment to a two-state solution.’ Can’t get anything past that guy! Members of the UN Security Council didn’t just fall off the turnip truck. The US is sitting there listening while, by Obama’s own admission, they’re bankrolling the settlements. How much of this charade are we expected to play along with? If there’s going to be any international conferences about Palestinian justice, it should exclude the shysters trying to get something past us. It should instead involve Palestinian activists educating other activists about the problems they face & how we can build solidarity with them; it should be about building BDS; & it should be about promoting a democratic secular solution that is the only possible solution. Enough with the bantustate drivel. Enough with the treacheries. It’s justice time. This is the funeral cortege of 29-year-old Palestinian Majdi Abu Omar who was shot dead near Nablus, West Bank by Israeli soldiers. There isn’t much information about his murder except a vilifying reference to him as a “gunman.” That’s not how we see those who stand up against Israeli colonialism. May he Rest In Peace.